Most of us love to play with several herbs and spices to flavor up our meals, but very few people realize that the benefits of these culinary magicians extend beyond pleasing the taste buds. 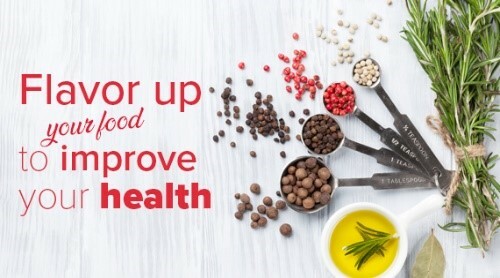 In case of older people who often complain about not being able to savor food like they used to, herbs and spices can be fantastic add-ons that can add the much-needed zest to their diet while positively impacting health. Instead of trying to uplift the taste of food by using too much salt, it is better to use these ingredients from your spice rack to bring your meals back to life. Oregano – This wonderfully aromatic spice is usually what makes food taste exotic. Just a pinch of oregano sprinkled over an ordinary boiled egg, or an uninteresting salad is enough to make your mouth water. What you perhaps didn’t know is that oregano is, in fact, fantastic for your gastrointestinal system too! It has excellent anti-microbial properties that have been found to be effective against various food-borne microbes. Rosemary – This is one herb that is used extensively across world cuisines. Fresh rosemary leaves can add a lovely aroma to foods, therefore, making them more appetizing. Apart from being a natural food preservative, rosemary has been found to be effective in slowing the progress of neurodegenerative conditions. It improves memory and cognitive abilities in older people. Another interesting effect of rosemary is that consuming it often helps in protecting the skin from premature aging that occurs due to excessive exposure to the UV rays of the sun. Basil - An herb that is extensively in Mediterranean foods as well as in South East Asian cuisine, basil is quite popular as a therapeutic agent too. It can help older people manage conditions like high glucose levels and hypertension. Additionally, it is effective in relieving constipation, heartburn and acid reflux. Cinnamon – Popularly known for its warming properties, cinnamon appears in the markets especially during the winter months to spice up everything from coffee to desserts. Researchers have found that cinnamon can protect older adults from various infections as it has antimicrobial and antioxidant characteristics. By boosting the immune system, cinnamon helps people stay fitter for longer. Green Cardamom – Little black beads of cardamom sealed in a neat green pod are nature’s gift to the art of cooking. These flavorful little beads are also perfect for managing some health conditions that commonly affect older people like hyperglycemia owing to diabetes. It can also help prevent halitosis and oral infections.